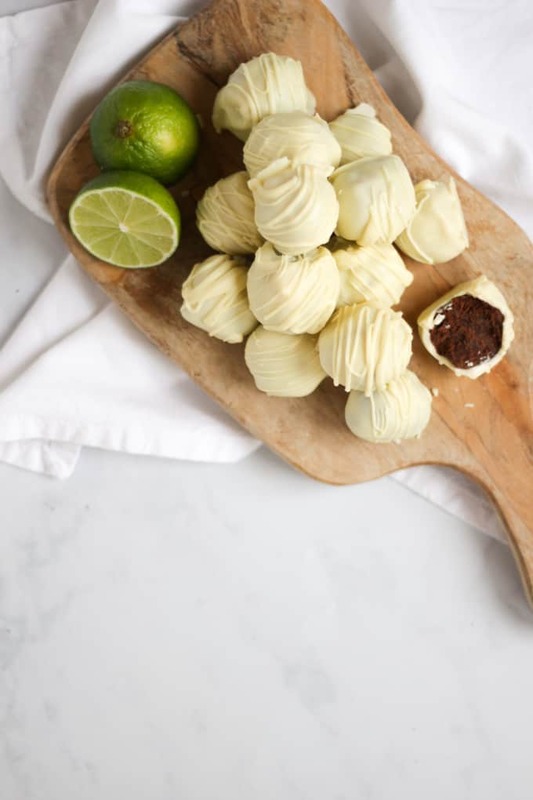 Gin and Tonic Truffles with white chocolate – these alcoholic milk chocolate truffles are the perfect homemade Christmas gift. This quick and easy no bake recipe means they are the ideal gourmet present for the gin or chocolate lovers in your life! What’s better than gin and tonic? Gin and tonic AND chocolate. Who knew?! I’ve been planning my festive food gift making for weeks, I’m doing batches of my Cookies and Cream Slow Cooker Fudge, and Christmas Rocky Road but fancied making something a little more grown up for my girlfriends. So, onto these truffles. Every year I try and make some homemade food gifts. It’s stretched from the sublime to the ridiculous if I’m honest. One year I spent MONTHS preparing homemade hampers for everyone, rather exhausting myself in the process. Totally worth it for the happy oohs and aaahs as they opened them though. There’s something really special about the love and care that goes into a homemade food gift isn’t there? For me, it’s part of the spirit of Christmas. Spending time, doing something thoughtful for loved ones. Oh and chocolate obvs. How do you make Homemade Gin and Tonic truffles? 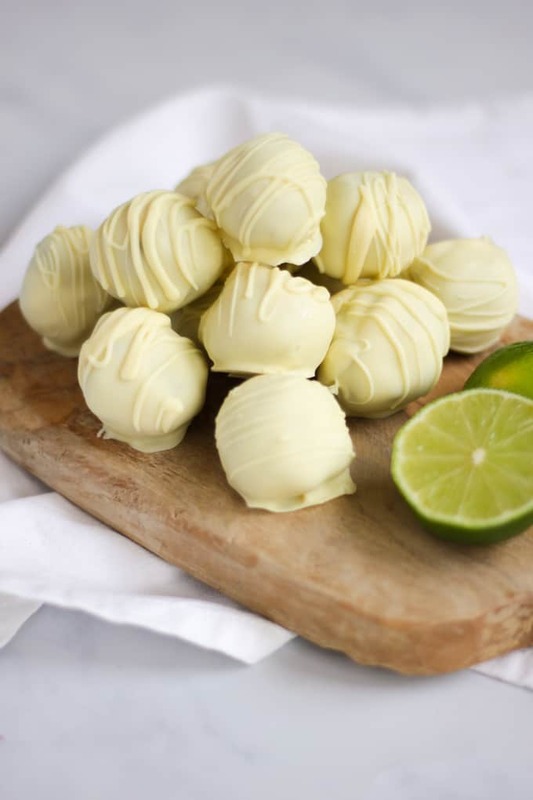 Making these Gin and Tonic truffles is a lot easier than you might think! The first step is to slowly melt the chocolate over a pan of simmering water. Once its fully melted you remove from the heat and add in double cream, gin, tonic, lime juice and lemon zest. Put the mixture in the fridge, uncovered, for around 2 hours or overnight if you have time. Once the chocolate mixture is fully chilled, form it into small, walnut sized balls with clean hands. Place the balls onto baking paper and pop back into the fridge for 2 hours or freezer for 1 hour. Whilst the chocolate balls are chilling melt the white chocolate in a bowl over a pan of simmering water. Remove the truffles from the fridge or freezer and dip to coat in the white chocolate, tapping off any excess. Allow the chocolate to set totally before serving. Serve the truffles at room temperature. How long do chocolate truffles last for? These gin and tonic truffles will last for up to a week in the fridge (depending on the use by date of your cream, so please check this carefully). For maximum deliciousness ensure your truffles have reached room temperature before serving. Do chocolate truffles freeze well? These really are the perfect make head Christmas gift. 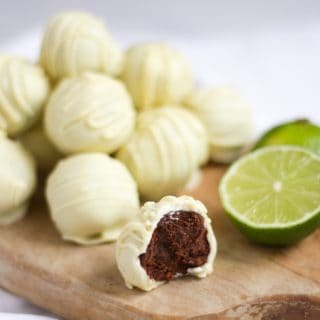 You can make the truffle filling (i.e do everything except coat them in the white chocolate) and freeze the individual balls for upto one month. You should defrost them over night in the fridge and coat them in the white chocolate the following day. Be sure to use good quality dark and white chocolate for the recipe – I try to use my favourite Callebaut chocolate for this recipe. This chocolate is just amazing, it melts so well and really makes a difference to any recipe. When you buy it in bulk (1kg bags at a time) from Amazon it works out about the same price as supermarket chocolate. A good investment I think as it really does make SUCH a difference. Take great care when melting your chocolates. Do it slowly and gently over a pan of simmering water or in a microwave, stopping to stir regularly. The best lesson I’ve ever learned about melting chocolate is do it SLOWLY. Use whichever gin you have or fancy. I used a drizzle of leftover white chocolate to flick across the top of them for the zigzag effect. They look fabulous packaged up in small boxes to give as gifts – have you got a link for these? For testing any kind of citrus fruit, I cannot even tell you how much this zester has changed my kitchen life! Available from Amazon and a brilliant investment: Microplane Premium Zester. I LOVE it! Hope you enjoy this recipe as much as we do. 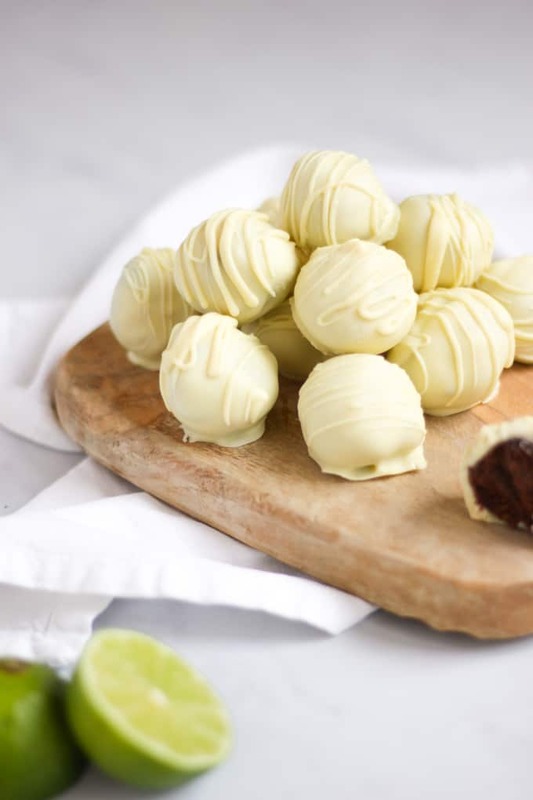 I’d love to know how you got on and what you thought of it if you make these Gin and Tonic Chocolate Truffles. Please rate the recipe and leave me a comment below if you do. Gin and Tonic Truffles - the perfect homemade Christmas gift. Ideal for a gin or chocolate lover in your life! Gently melt the dark chocolate in a bowl over a pan of simmering water (don't allow the bowl to touch the water). Remove from the heat and stir in the double cream, gin, tonic, lime juice and lime zest. Mix until totally combined and smooth. Pop into the fridge, uncovered, for 2 hours or overnight. Remove from the fridge and with clean hands, form into small, walnut sized balls. Place them onto baking paper and pop back into the fridge for 2 hours or freezer for 1 hour. Meanwhile melt the white chocolate in a bowl over a pan of simmering water. 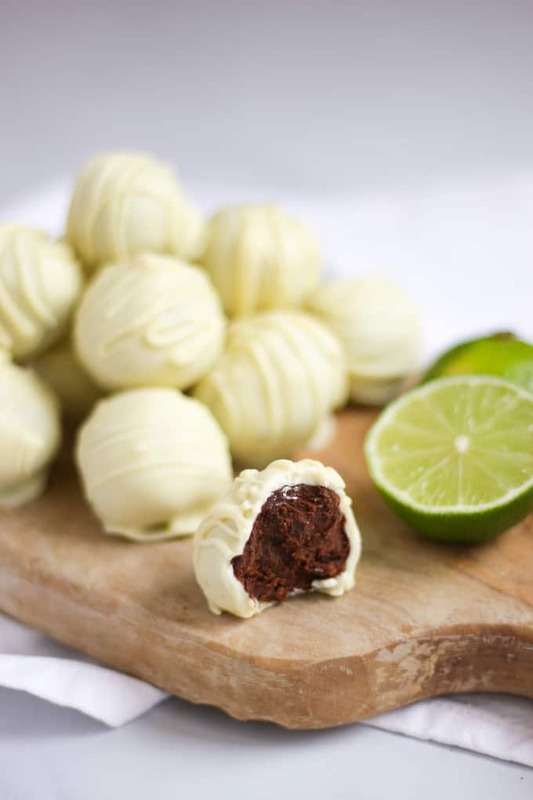 Remove the truffles from the fridge or freezer and dip to coat in the white chocolate, tapping off any excess. Allow the chocolate to set totally before serving. Serve the truffles at room temperature. If you would like a smoother, neater looking truffle, double the amount of white chocolate and repeat by coating again after the first dip has set. How long do you think these will last for? Just wondering how far in advance I could make them as gifts? Thank you! No, you can use milk but it won’t be such a good chocolate flavour. You may also need slightly more chocolate as milk doesn’t thicken as easily as dark. Hope it goes well! Yay! So pleased you liked them Vikki!